The past couple of days have been a blast and a half, as we have showed Skyler and Mommy more our favorite places and activities. Yesterday morning we got our morning exercise in by walking the usual 3 mile loop. Every time I pass it, the scripture comes to mind that talks about Christ loosening the bands of death, and I instantly think of Jan and Daddy. I think of how cancer bound their bodies down, and now they are free from those restricting and painful bands, and I am filled with gratitude. When we returned from our walk, we worked on some things on Tanda Malaika, and then set off for Starfish Beach. I made up a killer pasta salad for everyone for lunch as excitedly made our way West. Danny set up the hammock and both he and Mommy tried it out, and I got some iced tea brewing, which is so refreshing in this tropical sun. We tried making it with rooibos, which is a caffeine free tea I grew up drinking in South Africa. Try it if you haven’t, it’s jolly good. While underway, beautiful Mycah settled into the hammock with a good book, Aidan was full of cuteness as usual, and Emma took the helm (and she’s the cuteness at that job too!). Jude, Aidan and Skyler made their way up into the sail bag and watched for pirates, but unfortunately didn’t find any. We hoped to pillage their goods and give them what for. Being out at sea is such a peaceful, freeing feeling. When it’s just nature that surrounds me, with nothing man made in sight, I am happiest. The ocean was so calm, and the air was still, so we motored our way rather than sailing. I took my place on the trampoline and relaxed, and after a while Danny did too – with a sucker in hand of course. When we reached Starfish beach we dropped anchor and immediately broke out the stand up paddle boards and fired up the scuba compressor. Mommy and Skyler got to try paddle boarding and scuba for the first time. I was so proud of my mom, because she is afraid of the water and not only did she use a mask for the first time, but she allowed me to put my scuba gear on her and swim by her side as she dove on scuba gear. Both Skyler and Mommy did beautifully. Danny and I dove and it felt so good to be in the water. I figured I’d wash my stitches off with soap and water when I was done and call it good. No more staying out of the water for this girl! Jude bought herself a GoPro camera while in Idaho, so all the water shots on today’s blog are from her. When Mycah dove down to check on the anchor, she got stung by a jellyfish. It’s tentacles wrapped all around her calf and up the back of thigh a little. The picture does it no justice. She has large welts up and down her leg. Danny offered to pee on it but she politely declined, and opted for vinegar. That didn’t help either, so Emma tried lime juice, which only made it itchy. Finally Emma mixed up baking soda and salt water and smeared that all over the sting, and Mycah felt instant relief. We spent the night at Starfish beach, and loved our time playing in the water once again today. Finally we decided it was time to set sail, as the breeze changed to a light wind, and in the distance we could see the wind line with white caps beyond it. The sky was darkening too, so we raised the anchor, and set the sails, and silently moved through the water. Mycah and Emma did the happy dance as we sailed along and Mommy sat on her perch at the bow. Once reaching Bocas we dropped anchor once more and made our way into town to provision a little and grab an early dinner. Our outboard engine for the dinghy was supposed to be in today, but Danny was told to come back tomorrow..which could mean the tomorrow after Wednesday of next week! Mommy took the helm for a bit as Danny guided her, and somehow she managed to make Tanda Malaika zigzag back and forth across the water, like a drunken sailor was at the helm. I love to watch the creatures all talking softly together, laughing and enjoying the beauty that surrounds them as we sail. It brings me so much joy. As we approached Red Frog Marina, I looked back off the stern at the tranquil scene behind, and was filled with so much gratitude for life. For the exquisite world we live in and for the opportunities we have to be a part of it. Mommy thanked me for showing her a whole new world. I love sharing it with her and watching her embrace it too. Today was nothing shy of just plain blissful! I woke at 7:30 and got ready to exercise (like we’d all agreed), but every soul on Tanda Malaika was fast asleep, so I ventured off on my own. The scenes before me were beautiful as noisy parrots were already causing a ruckus overhead, and howler monkeys mischievously made their way through vines and across branches as I passed them by. They are so fast but I did get a blurry shot of two of them. Flowers were already being visited by insects and contrasted beautifully against the green of the jungle. As I walked I thought of Jan and Daddy, wondering what they are up to, and if they could see what I was seeing – sharing the moment with me. I miss them so much. When I returned home, Danny was up working on projects, and creatures were busy on school work. The most exciting project of the day was placing the lettering for Tanda Malaika’s name onto her. She looks so proud and pretty. We are so excited to finally have her name on her…”Tanda Malaika”….Guardian of the sea. Mommy and the creatures went to the beach while I took a siesta and then started on dinner preparations. Danny worked on several more projects, accomplishing so much! The water was clear and calm, and even Mommy who is usually afraid of water, had a jolly ole time splashing in the water. I still have two weeks till I’m allowed to go in, but that is about to go out the window because I can’t stand staying out much longer! Dinner for tonight is Coconut curry chicken over rice with corn on the side. We all seem to work up an appetite over the day, and have been drinking gallons of water. The average daily temp has been around 90 degrees with 60% humidity. Life is good, and we are grateful. Our time at sea yesterday was spectacular. Their wasn’t much wind for sailing but it was so simple and peaceful. I think that is what draws me to it…the perfect simplicity of nature. I showed Mommy a great place to sit while underway, and it soon became one of her new favorite places to be. In fact, what makes it so perfect is that one can be pampered with a first class foot massage at the same time. We hugged the coastline watching for new places to explore, and found many beautiful little beaches for bonfires and coral reefs for scuba diving. We also saw many beautiful little homes nestled in the palms too, and I thought of my sister, Denise and her husband Shad, and how much fun they’d have remodeling and decorating some of the homes. We finally rounded the corner, and headed back East on the leeward side of Isla Bastimentos again, and came into the Marina. Jude captained a good chunk of the way. Back in the marina, many jellyfish had drifted back in. In this picture, most are males. They eat small plankton, like mollusks, crustaceans, fish eggs and other small jellies, and grow up to 15″ in diameter. You can often tell what they have been feeding on because their color changes accordingly. Adult male moon jelly releases strands of sperm from their 4 gonads which can be clearly seen through their transparent bodies, and these strands are ingested by female moon jellies. After fertilization has taken place, larvae settle down onto the seafloor and develop into polyps. They live for up to 25 years and their juveniles are called ephyrae. The males have short fringe like ‘tentacles’, or cilia, where as the females are much smaller and have long cilia which sting when touched. I have been stung several times and for the first couple hours it feels like you’ve been burned with extremely hot water and after that the welts that form become extremely itchy. It’s quite invigorating. When we were in Bocas the other day, I bought what I thought was yucca, but when I peeled them it was obvious that it wasn’t. The yucca I’ve peeled in the past has been covered in a slimy covering and these felt more like a sweet potato, but raw it tasted like jicama. I cut it into chunks and cooked it up and once tender, covered it in butter and salt and pepper. It was really dry but quite delicious. The creatures put brown sugar on it and loved it that way too. At the close of day, the marina looks so beautiful as it darkens and rests for the night. I am so grateful for yet another day of life. Today was filled with grand adventures. It began at 7:30am when we all (except sleepy Danny who was still resting from his stud day yesterday) dressed and went on an adventure in search of sloths and red frogs. Skyler and Mommy hadn’t seen them yet, and we felt obliged to show them the cute little creatures. This morning was beautiful. Flowers were vibrant and the jungle was emerald green from last nights rains. Each strip of compound flowers were about 8-10 inches long and resembled corn on the cob that was large and flat, and some had tiny flowers protruding from their tips. Amazing! This one was interesting too, it looked like some whatchamacallit oozing out from a thingamajig, surrounded by exploding doodads. Nature fascinates me. We came across a couple of sloths doing what they do best: sleep and ever so slowly eat. This one was making his way down at a snails pace in an upside down position. We reached the trail that leads into the rain forest where the red frogs live, and I warned Mommy, telling her to watch out for the R.O.U.S’s and fire swamps. (For those who haven’t seen the movie, Princess Bride, a R.O.U.S is a ‘Rodent of unusual size’) Vultures even watched from overhead for left overs. The jungle was so thick and alive. All the creatures climbed a staircase that leads to a platform used for ziplines. We did find red frogs, and Mommy and Skyler thought they were quite cute, and loved the remainder of the hike as well. After returning we were drenched with sweat and had worked up quite an appetite. Everyone chowed down and then the creatures worked on their school work and chores. Their next adventure involved going to the beach for a couple of hours while Danny, Mommy and I stayed to work on things on the boat. Danny, of course got both engines running well. I guess that makes him a stud today too. By the time the creatures returned they were so worn out and tired of the sun, that they came in and lounged around for a while. We were of course anxious to run the engines, so we counted heads making sure everyone was on board, and tossed up the dock lines and set off on the next adventure. When we started, Mycah and Skyler looked like this….and at the end of our adventure, they still looked like that. They slept through the whole thing which lasted a couple of hours! We headed West then turned the corner looping around to the windward side of Isla Bastimentos, and ventured East for a while. I love the sight open ocean. The water was incredibly calm. The internet is slower than molasses on a cold winter morning right now, so I will continue writing of the remainder of our adventures in the morning…. The sun goes down quickly here. By 6pm it’s dark and feels like 8pm, and in the mornings the sun rises quickly, grabs you by the hand and pulls you out of bed. It’s a beautiful place to be alive. Since returning to the boat, a few things have needed encouragement to get working, and for some reason the port side engine is one of them. When we returned from the US, all electricity had been shut off to our boat, so the house batteries were completely drained, and also the starter batteries in each of the engines. This morning Danny climbed down in to the port engine room and removed the battery because it refused to charge, and we figured we’d purchase a new one in town today. I replaced the starter on it about 3 months ago, so we wondered also if that rebuilt starter could be bad again. We made our way in to Bocas on the starboard engine, and anchored in our usual spot. Everyone enjoyed the ride in, and Mommy looked like a little doll all pretty in pink on the bow. Aidan took his place as look out for pirates and later Jude did too. Once we anchored, Jonathan took us in to a dock in town and dropped everyone except Danny off, so we could go grocery shopping, and then he and Danny went battery hunting. Our group made our way through town, and made our first stop at the bank for more quarters for laundry, and then the produce store. We bought everything from yucca, bananas and bell peppers to plantains, pineapples and tomatoes, and then made our way to the grocery store. By the time we were done, we were pretty heavily laden with bags, and the store owner offered to give us a ride in his pick up to our drop off point, so we accepted…. Everyone and the groceries loaded into the back and I sat up front and showed our friend where to go. The entire time I heard giggling from the back as we meandered through town. We waited for Danny and Jonathan to get back, and after a while the girls swam back to the boat while Emma, Mommy and I caught a $3 water taxi ride back with all the groceries. By that time we were all hot and sweaty, and the creatures had a blast jumping off the boat for quite a while. Finally Danny and Jonathan returned in the dinghy, being towed by a panga, and told us how they’d carried the 70 lb battery all over town, then started back and the engine on the dinghy seized so they rowed to shore and got a panga driver to tow them back. Danny inserted the new battery to find that the battery wasn’t the problem in the first place, so he lifted it back out from the engine room, and he and I went back into town where he carried the darn thing across to the battery store again to return it. We then ordered a new engine for the dinghy, and made our way to the opposite end of Bocas to pick up mail and packages, (the two starters and solar panel had come in), which were so heavy, and because Danny is so protective of my newly operated on shoulder, he carried those heavy items like an African stud. On his head and under his arm! He would absolutely not let me help him! I’ve definitely met my match when it comes to stubborn. He was so sweet, checking on me and making sure I wasn’t hurting. I told him the only time it hurts is when I walk like an orangutan on my knuckles…that kind of bothers my shoulder. Finally we made it back to Tanda Malaika, tried to rest for a second but couldn’t, so we headed back to Red Frog Marina. The sun was starting to set and it was absolutely gorgeous. Danny was an amazing ninja at docking the cat on one engine, after which we hosed our girl down and I started on dinner. Once again everyone is showered up and snug in their berths. Last night, Skyler, Jude and Mycah laughed the night away but I think tonight they will be tired enough to fall asleep quickly…but you never know. I am so grateful for the beauty that surrounds us, and I am especially grateful for all Danny’s hard work today. I am so blessed. Home. Where mangroves arch their roots like a tired old mans back, and a tangled mess of branches reach up praising the blueness of the sky. Where dolphins play lazily without any agenda and green parrots squawk overhead in no particular formation. Where Indian children row their dugout canoes in search of fish to catch and brightly painted buildings are tall and proud on stilts. Where water laps against the hulls of our home and our mast stands ready to carry the sail that takes us on the next grand adventure. This is home. Our home, where love and laughter flow freely just like the ocean below us. It feels so good to be back. This morning came and went early and quickly and then the day moved in slow motion for many hours. Our flight to Bocas was delightful as we watched over thousands of acres of rain forest wake to the new day, and the water taxi ride from Bocas to Red Frog Marina was refreshing as it always is. I closed my eyes and breathed it all in, feeling gratitude and peace. As we turned passed the last mangrove stand and saw the masts reaching toward heaven in the marina, I felt butterflies from my toes to my nose. Mycah clapped her hands then held them tight in excitement. Then there she was…our faithful home still waiting in anticipation for her family to return. We called her name and hurried toward her, oh how we missed our Tanda Malaika (‘Guardian of the sea’ in Swahili). As we made our way inside, we instantly knew that 2 1/2 months away from a boat leaves you with the opportunity for a good scrub down to all her surfaces. We learned a good lesson we’ll never forget – leave a dehumidifier running while you’re gone. Everyone cheerfully got to work with bottles of simple green spay and rags, and after working till we dripped with sweat we finally have her looking so much better. Mycah and Skyler fell asleep on the job and Emma found a most interesting place to hide and sleep. Under the table in the stern salon! Our sweet mother, who never sweats, couldn’t keep her glasses on because they kept sliding down the sweat on her nose, so she kept them up with toilet paper! Danny and Jude installed a new fuel tank sensor on the port side. 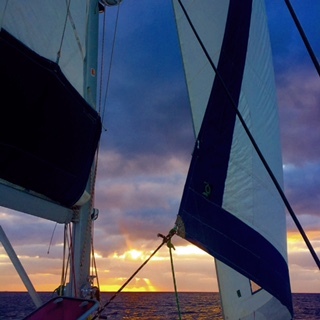 After well earned showers and family prayer, we are all snuggled down in our berths, ready to dream of endless horizons, fair winds and following seas. Today began nice and early. kjira dropped us off at the Idaho Falls Airport where Skyler was ready to join us. Our friends, The Kecks came to say good bye and we gave lots of hugs and kisses then disappeared behind the security area. The creatures found ways to entertain themselves…. Danny looks like a drag queen! All travels went smoothly, which we are so grateful for. Even Houston cooperated. We wondered how the weather would be after the hurricane, but aside from rain all was fine. Flying to Panama City, we saw some gorgeous cloud formations. I am so grateful for all Danny’s help today. He was such a Sweetheart. Every time I was about to do something, he had done it for me and was so protective of my shoulder. What a great husband he is! I’m also grateful that my sweet mom and Skyler are with us on this trip, and it thrills me to see how excited the creatures are to be getting home. Tomorrow morning we will wake early and fly in to Bocas, then catch a water taxi to our home.